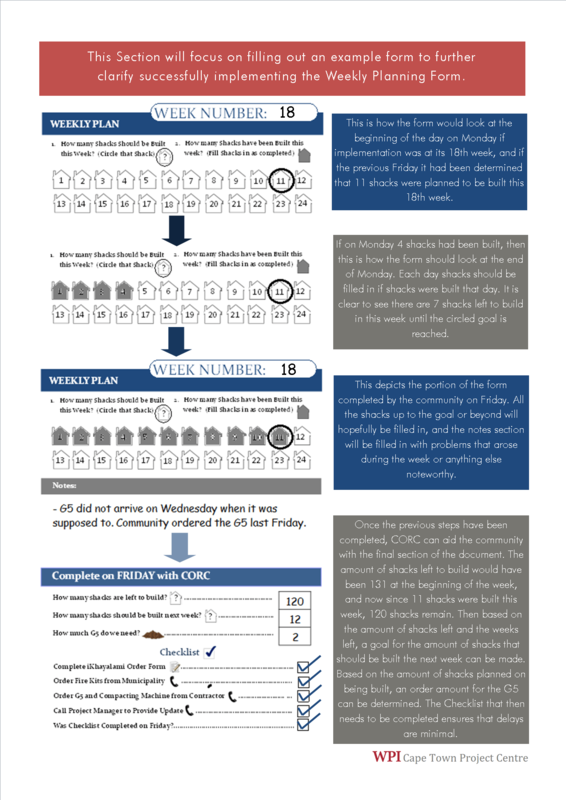 A copy of the Weekly Planning Form, which details on-site progress and planning for a week's worth of work. Making several contributions to Mtshini Wam has been such a rewarding experience, but without proper transition plans for continuing the efforts made in our two months here, the community would be at a loss for mass scale implementation. Just as pertinent, we have been told on several accounts that there is no “how-to” guide for reblocking an informal settlement; instead, it has been largely a “learn by doing” project. So, in one of our efforts to help improve the process of reblocking, the concept of a guidebook soon became a team venture. Filled with forms on partnership agreements, material and planning forms, and explanations for each recommendation, this document is intended to be left with each external partner furthering reblocking efforts around the city of Cape Town. With this kind of forward thinking, the partners can fall back on two months’ worth of on-site research for efficiently performing a reblocking project. Here, we’ll take a glimpse at some of the important portions, while the entire document will be available for viewing in our Documents section. If we zoom into the document noted on the right, we will see the Weekly Planning Form for an informal settlement. 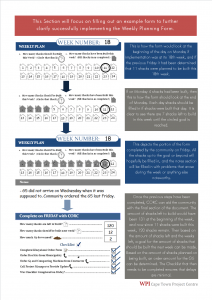 This Form is to be filled out by the leadership of the community each week when updates become apparent. 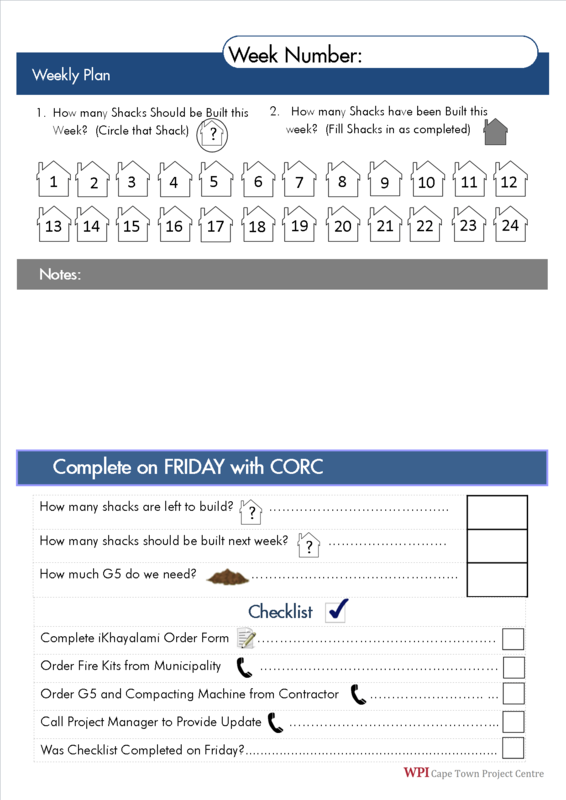 Such updates include how many shacks have been completed toward that week’s goal, any notes on issues in the process, and an end of the week checklist for proper supply chain management the next week. The reasoning behind only one week at a time is that it compromises the informality of on-site work planning we have observed on the ground with the advance planning style of the external partners. 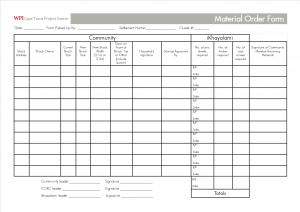 With several visual images and check boxes, the instructions and corresponding information are fairly transparent to all those involved with handling the responsibility of this sheet. 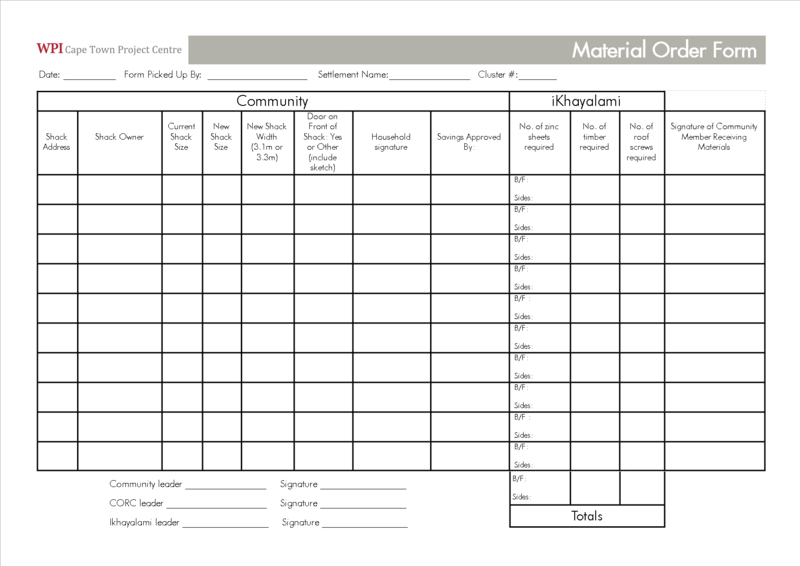 Material ordering forms will serve to minimize supply chain flow and proof of proper savings issues. Digging further into the process, we observed that planning by cluster was important to the community workers, as it would give them an understanding of current working space while keeping the work rate efficient. However, a cluster could not be reblocked in Mtshini Wam unless all of the cluster’s owners fully paid their housing savings. In upcoming reblocking efforts, this form will evade that issue. As noted on the right, one can see that the names of a cluster’s shack owners will be marked down with all of the housing information involved with reblocking their home, as well as the materials required. 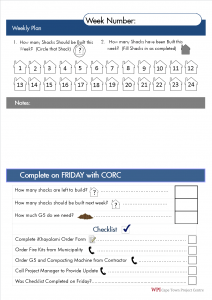 This form’s housing information is to be filled out prior to the start of reblocking in the community, while the savings information is filled in as payments come in. It relieves the need for last-minute switches on reblocking plans, while keeping all relevant parties informed. 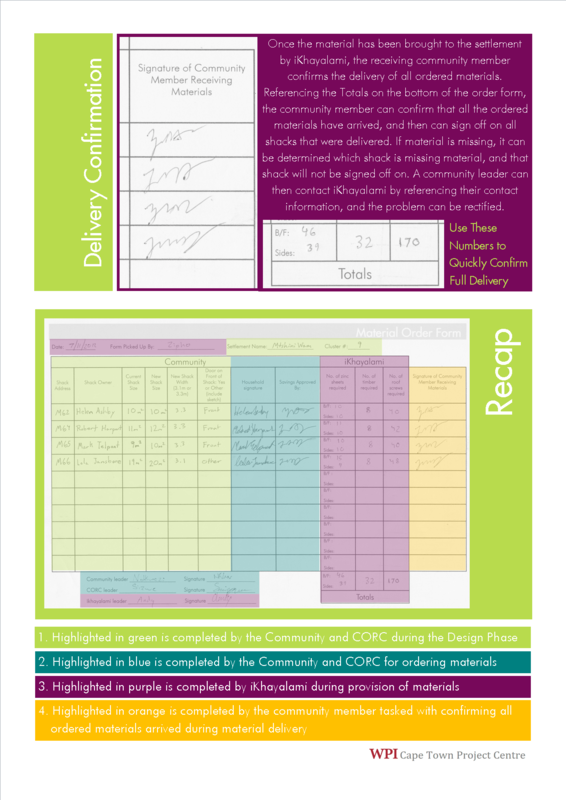 In presenting these forms to the City of Cape Town and CORC, we received great feedback on their content, layout, and information flow. Following the conclusion of our time in Cape Town, we will be continuing to keep in touch with representatives from CORC, ISN, and the Municipality to understand where the guidebook has helped influence other reblocking projects.